This Saturday, live from the Barclays Centre in Brooklyn, we will see the return of one of boxing’s most accomplished young champions, Danny “Swift” Garcia, against one of its most seasoned challengers in Lamont Peterson. The matchup has been one of the most anticipated bouts in the division for over a year. The fight we’ve been waiting for doesn’t come without its misgivings. Bizarrely, no titles are at stake and its being fought at a catch weight of 143 pounds, at the request of Garcia’s camp. Still, the bout looms as a fascinating styles matchup between two consistently entertaining boxers. 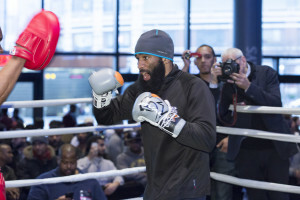 Lamont Peterson is a beautiful fighter to watch when he gets into his groove. He has the kind of all-around skill set and nifty moves that you just don’t see many fighters employ into today’s boxing landscape. Peterson can deftly box from the outside, but is also a capable craftsman on the inside. It’s the reason why he’s survived so long at the top of the talented-rich 140 pound weight class. Despite his boxing acumen, Peterson has never been able to make the transition from a very good fighter into a great fighter, because he lacks the “x-factor” requisite of the very elite prizefighters. Peterson doesn’t have blinding speed or sudden fight ending power, and often slugs more than his fragile chin often allows for. In the biggest fights of his career, Lamont has almost always come up a little short. Tim Bradley out-worked Peterson. Ortiz’s power caused Peterson to hit the deck twice, likely robbing him of the win. In the biggest win of his career, it is felt by many that he was the benefactor of home cooked refereeing and judging, despite his superb effort. In the last major fight of his career, Peterson was torn apart in just three rounds by the awesome power of Lucas Matthysse. At 31 years of age, the stakes are dangerously high for Peterson against Garcia, as it might represent his final opportunity to convince the sporting public that he’s of boxing’s elite. Based on his previous track record, this might seem like a long shot, but a boxing match can often boil down to how one fighter’s style computes against another. In order for Peterson to pull off the upset, he must come into the ring with a more disciplined and consistent fight plan than he has often shown in the past. The fighters who give Garcia problems are crafty boxers that switch up their rhythms. The herky-jerky, in and out movement of Mauricio Herrera gave Garcia nightmares because he could never time the big counterpunch. Garcia can fall into the trap of looking for the knockout and can be out-boxed and outworked during these stretches. 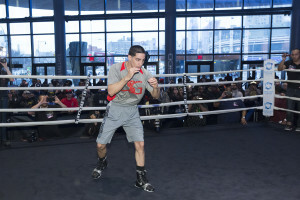 Even a decrepit Erik Morales was able to give Garcia fits during their first bout. For Peterson, the key to the fight will be switching angles, creating distance and using the jab to off set Garcia—who needs to be set to punch. Feinting Garcia to throw the big left hook—which he often throws very widely—would also set counterpunching opportunities for Peterson, who is an excellent combination puncher. 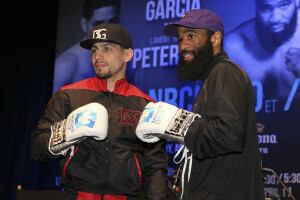 Danny Garcia’s career stands in stark contrast to that of Lamont Peterson. Despite not possessing the obvious technical skills of Peterson, Garcia has always proved to be more than the sum of his parts in his biggest fights. Garcia has played the role of perennial underdog throughout his career and has thrived in the face of his doubters. No matter how many times he proves to us that he is a born winner, the vast majority continues to doubt him. Garcia has been so successful because he does have an “X-factor,” which is his ability to end any bout with just one punch. Garcia has also shown the ability to process well in high-pressure situations. In the face of danger, Garcia remains stoic and poised. He’s showcased these two dynamic faculties in various fashions in some of his biggest fights. Despite giving up a massive speed and talent advantage to Amir Khan, Garcia was able to withstand Khan’s early assault and think his way to victory. Garcia was clever enough to understand that if he was able to time the speed of Khan’s assaults and punch with him, then he could lure him into a false sense of security and time him with the left hook. He did just that in the third round and Khan was never able to recover. Against Lucas Matthysse, where he was the massive underdog, Garcia showed incredible poise in the face of tremendous offensive force. A nip and tuck fight was broke open in the midway stage when Garcia was able to pull away with superior counterpunching and ring generalship. He also showed a great chin when he had to—often an essential attribute of a great champion. Despite boasting some of the best wins of any top ranked fighter, Garcia has been shunned from most of the “pound for pound” lists and is widely derided as being one of the biggest heels in boxing. Just check out the various online boxing chat rooms if you doubt this. The reason is hard to put your finger on what makes him so dislikable to so many. Is it his absolutely loathsome father/trainer Angel Garcia, who also moonlights as Garcia’s mouthpiece during fight week? Is it his awful understanding of sartorial protocol? That certainly isn’t helping his case. The answer maybe much more simple: Garcia didn’t give the fans the fights they wanted last year. Fighting Lamont Peterson is a step in the right direction and a chance for Garcia to see how he functions with a little extra weight on his body. On paper, it doesn’t appear to be an easy style match-up for Garcia, as Peterson represents the most gifted technical boxer he’s faced as a pro. In order to offset Peterson, who will likely box more than trade, Garcia must produce a more consistent offensive effort like he did in the Matthysse fight. If Garcia waits to counterpunch, he might discover that Peterson is too quick and skilled to fall into a trap like so many others have. Garcia has the kind of brash confidence that only an undefeated fighter can possess. The comment was also a dig at Peterson’s inability to box when a fighter who can punch begins to tag him. Many experts share in this opinion, and it’s the reason why Garcia must be favored in the fight. The preliminary bout of the evening is a fascinating matchup between former titlist Peter “Kid Chocolate” Quillin, (31-0-0 22 KOs), and perennial contender/recently converted titlist Andy Lee, (34-2-0, 24 KOs). Quillin’s reputation, much like Garcia’s, suffered massive damage during a mostly wasted 2014 campaign. He fought just once in an uninspired effort against club fighter Lukas Konecny and was convinced by a certain mysterious figure to give up his belt (and turn down a career high pay-day) in a highly winnable fight against mandatory challenger Matt Korobov. Instead it was Andy Lee who stepped in and scored a miraculous, come from behind stoppage and at last fulfill the prophecy of his late trainer and mentor, Emanuel Steward. It was a stunning and emotional scene watching Lee achieve what many assumed he would never achieve as he also snagged Quillin’s old strap. Despite being out of the ring for what seems like an eternity, Quillin will go into the fight as a solid favorite, because he has been more dominant against a similar quality of opposition. Quillin is also the more dynamically athletic fighter and appears to be much closer to his prime than Lee, who has a lot of wear and tear from big fights. Perhaps because he won a title, many seem to have forgotten that after the Julio Cear Chavez Jr. fight, Lee looked to be on the downside of his career. In his subsequent fights, including his title winning effort, Lee has shown very little other than a devastating right hook. That might not be enough against a confident and hungry fighter like Quillin.